A water fast is the cessation of food consumption for a certain amount of time. During that time you can consume water, black coffee, tea, and bone broth. Fasts can vary from short ones (12 hours) to extended fasts (5+ days). Fasting has been practiced across many different cultures for thousands of years as a period of healing, spiritual uplifting, and abstinence. Our evolutionary upbringing is closely linked to fasting since food back then was mostly scarce and competitive to procure. Our ancient ancestors would forage for food then use their body fat as fuel when food actually became scarce; or, better known as feast and famine. Now that science has substantiated many of its health benefits, fasting can be used as a tool to repair your anatomy, breakdown fat, and increase mental acuity. You can fast as long as you have adequate body fat and your nervous system or adrenals are in their proper state. Remember: fasting is a stressor on the body, so all your hormones must be normalized before getting into an extended one or else you only exacerbate whatever symptoms you’re currently experiencing. In most cases, you can only oxidize fat at a half a pound of body fat per day, so when people are losing weight really fast, it’s not actually body fat, rather muscle, inflammation, or water. Fat takes time through strict nutrition, exercise, or infrequent eating patterns that keep your insulin signaling low. Fasting tends to not be broached in mainstream media and nutrition because it doesn’t sell; no one makes money when people aren’t eating! Dr. Jason Fung, who deals with a multitude of patients with kidney disease and diabetes in an interview talks about fasting as an alternative, healthier way to burn fuel. “During fasting, you start by burning off all the glycogen in the liver, which is all the sugar. There’s a point there where some of the excess amino acids in your body need to get burnt as well. That’s where people say, ‘That’s where you’re burning muscle.’ That’s not actually what happens. The body never upregulates its protein catabolism. Never is it burning muscle; there’s a normal turnover that goes on. Periodic or intermittent fasting have been shown to increase testosterone and human growth hormone –two important factors in building and maintaining muscle mass PLUS the anti-aging effects of HGH not only turn back the clock internally, but externally as well. This muscle conservation stage has an expiration date though, usually after 10-15 days of extended fasting muscle deterioration may occur, BUT depending on how much body fat you carry (some people can fast longer than 30 days without muscle-wasting due to having excess body fat). A popular misconception in the health industry is that once we are in a starved-state, our bodies seek our muscle as fuel, but that’s simply not true–if it were, we would have been extinct a long time ago. 1 in out of every 2 Americans have a chronic disease! Any fast over 20 hours increases and maximizes cellular autophagy: a physiological process whereby the body starts cleaning out the junk in the cells that accrues from free radicals which ultimately age you and engender cancer tumors that can proliferate to major organs. In recent research, cancer and Alzheimers are now showing signs of being a metabolic disease (high blood sugar/insulin) rather than just a genetic disease. Although more research is to be done on the correlation between insulin/blood sugar and cancer, it’s safe to say that keeping a close watch on your numbers would be salubrious for longevity purposes. That said, giving yourself a long fast once a year to lower insulin could potentially rid any cancerous cells from accumulating. The graph below illustrates how when insulin drops, HGH increases. The record for fasting is a shocking 382 days. The man weighed 456 lbs and dropped to an astonishing 180 lbs. Although he was heavily monitored by doctors and supplemented vitamins, he recalled the experience as being liberating with “hunger not really occurring.” So, that proves that the body doesn’t automatically eat at muscle when it’s starved, but rather adipose tissue (body fat). Ketosis is the metabolic state where your body begins using only your actual body fat as fuel when your insulin is low. Ketones are produced from the breakdown of fat in the liver. For the ketogenic diet, most people need to consume no more net carbs (total carb-fiber) than 50 grams a day to induce ketones. The diet consists primarily of vegetables along with eating moderate protein and higher amounts of healthy fats. Eating fat burns fat and the fat on your body is the result of mostly eating sugar and carbs. Ketone bodies have myriad benefits from decreasing inflammation to eradicating type 2 diabetes to treating people with epilepsy. 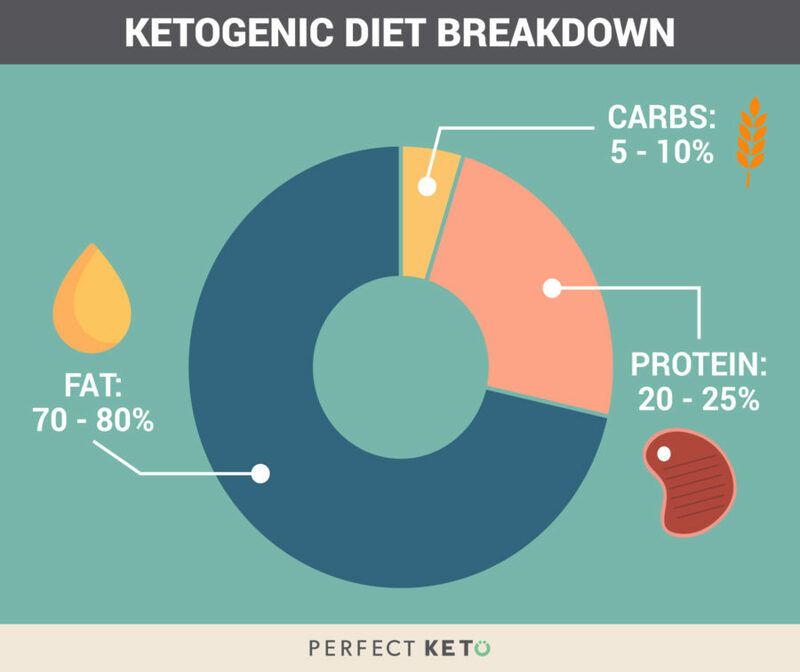 Below shows the breakdown of the Keto macronutrients. Fasting is a surefire protocol to fast-track your way into ketosis. Cravings literally disappear. You’ll no longer be in a glucose-dependent cycle, but rather a fat burning one; replete with energy and clear-headedness. Depending on if your body primarily runs on fat or sugar will dictate how long it takes for you to enter nutritional ketosis. Eating too much protein or carbs will usually knock you out of ketosis. Below is a graph that shows when your blood sugars drop, ketosis is induced. Consumption: 3/4th gallon of water with Himalayan sea salt. Vitamins B and C.
After an amazing nights sleep, feeling much more grounded and focused today. Feelings of elation and hyper-activeness are surging through me. Hunger pangs haven’t shown themselves. A midday walk was filled with creativity and wandering thoughts. Got a bit tired toward the evening time. Another pretty good night of sleep. Completely in ketosis. Went for a casual morning walk around sunrise. Mentally sharp and extremely focused. A brief moment of weakness occurred in the evening, but was fleeting. Hunger is neutralized. Feeling the best I’ve felt all week. In complete ketosis now, as my readings are showing 4.0 mmol/L or better (Using ketone strips via urine you can identify how deep of ketosis you’re in which means your body is now using fat as fuel and insulin is low; great for longevity.) Everything I’m reading is being retained faster than normal and my well being is excellent. The psychological factor of food is beginning to settle in. Lots of stimuli is easy to repress for a short while, but not it’s seeping through the cracks. That said, I’m not physically hungry. Consumption: A little over a gallon of water. Half a cup of black coffee. Vitamins B and C.
Slept pretty well last night. A lot better than the previous night. Brain is functioning high again, body is getting a little run down. No exercise today. The external stimuli of food is definitely enticing me to eat now. Constantly thinking one more day, but still not feeling all that bad. Woo! We made it! Although I slept a paltry 4 hours due to becoming a bit dehydrated in the evening, all is freaking well. Energy is very good. Finally get back to the gym and lift weights with having not eaten in 7 days. My strength hasn’t waned much at all. About 2% of max strength has declined. My stamina has been compromised a bit though as I feel myself panting much faster than normal. After I worked out there was still about 2 hours before I finish the fast. As odd as it sounds, I definitely felt as if I could go another day, but let’s not get crazy here. Broke the fast around 4pm with watermelon, steamed broccoli, and some various other blended fruit. Boy, was it a joyous experience. Everything tasted so authentic and flavorful. Breaking a fast isn’t something to play around with. People have suffered many complications from coming out of a fast full tilt; eating whatever they want. Since the long fast has repaired the body, it also has basically shut down digestion and in order to reboot it, you must have a reintroductory phase of eating. The following two days after an extended fast must consist of blended fruit shakes and steamed veggies then you ease your way into harder-to-digest foods in the subsequent days. The enzymes that breakdown food need a little time to reactivate, so this 36-48 hour period must be dealt with patience. In conclusion, the fast was an enlightening, emboldening experience. Overall, it was a revelatory adventure. I felt amazing for about 96% of the 7 days, which in my estimation is from being used to intermittent fasting (my current dietary protocol) The mental clarity and enhancement of senses was truly remarkable. The introspection aspect of noticing how hunger comes in waves and how we aren’t really ever starving, but rather conditioned to eat from routine and psychological, external stimulus. Majority of the time I felt a newfound appreciation for being in the moment with a heightened sense of stillness and focus. Anxiety didn’t exist at all throughout the fast. The profound energy and motivation is indescribable unless you try it. I did not do this fast to lose weight, but instead to get the cerebral and anti-inflammatory benefits after a gluttonous holiday which help for the future. Some of the nights of sleep were the deepest I’ve experienced since being a kid. My mood and well-being were in great spirits. Thoughts, creativity, and reading comprehension ostensibly worked better and more fluidly than when I am in a fed-state. You also notice how everything you consume in life has an effect on your entire bodily system from sleep to mood swings to energy. A 24-hour fast once a week should be a staple in everyone’s lifestyle to let your body heal and repair. Personal experimentation is one of the rites of passages of being a human being. Not just one dietary protocol works for everyone, but fasting is built into our DNA. Give it a try. You won’t wither away, the body wasn’t designed to let us perish when a little bit of stress is on us. We are built to survive and minor stressors on the body can, in the end, strengthen it. Chronic diseases are costing us billions of dollars as a nation and it’s only getting worse. Inflammation is the precursor to chronic diseases and what causes inflammation? sugar, obesity, stress, drugs, overtraining, overeating, injuries, infections, sleep deprivation, and diseases. What helps all of those? This entry was posted in Entertainment, exercise, health, intelligence, Lifestyle, psychology, science, Uncategorized and tagged cancer, diet, exercise, fasting, food, health, life, lifestyle, news, nutrition by Dominick Sair. Bookmark the permalink.